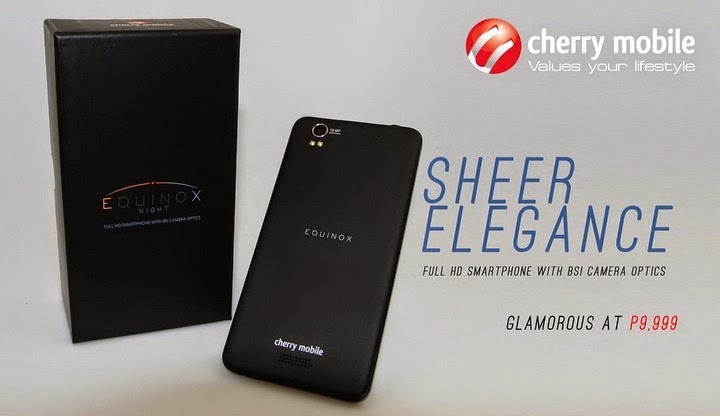 The Cherry Mobile Equinox Night is a very elegant addition to local fruit company's line of smartphones. The device is positioned with svelte design and full HD 1080p display. The Equinox Night comes with an exquisite construction and boasts a lot of stunning features to give you only the best experience with its Php 9,999 price tag. The device sports a 5-inch IPS Full HD (1080x1920p, 441ppi) display and is treated with a Dragon Trail glass so that it could widthstand occasional bumps and scrathces. It also has a 1.5GHz quad-core processor and 1GB of RAM in its gut. Aside from the stunning display, this Equinox is equipped with 18MP BSI camera with dual LED flash and a 3MP front-facing shooter so you can brag about your photos in social media. Connectivity-wise, there’s 3G/HSPA+, WiFi and Bluetooth on the specs sheet with GPS and A-GPS support for location services. The phone is banking on its 2300mAh juice to power your everyday needs. CM is also giving free PowerBank in case you run out of battery on the road. Just one major downside of Equinox Night is that it's running in an older version of Android OS – Jelly Bean. But with nifty features in line like Full HD display and high-sensor camera, every inch of this device is utilitarian and function-first just like its other higher-end brethren.